A positive attitude and open mind ready to connect with our hostesses, our guests, the staff and the overall bliss experience in the knowledge we are here to help. You love the idea of doing things on your own and tailoring your experience just the way you would like by communicating your needs and wants to our hostesses. Flexible and open and understand that although we do our absolute best to get you into things at certain times this is not always possible, but we will always give you the options of things to do and the choices at hand. You care about others whilst still being committed to following your own bliss your own way. Understand that things don’t always run smoothly in Bali but we are working hard behind the scenes to help you feel safe, secure, cared for and to facilitate the best experiences for you. Our hostesses are here to facilitate your experience, they are not professional counsellors. Everybody we recommend and the places we recommend are subject to availability and do not suit everybody. It is your choice what you would like to try. You are not looking for group activities, you are wanting to connect with yourself and others and follow your own holiday bliss in a relaxing stress-free environment. You are not looking for a detox retreat as we do not serve specialised weightloss food. We serve blissfully good food and juices with a healthy choices menu which is more like a hug in a bowl. If you are a happy person with an amazing attitude who looks for the good, how you feel about your stay will reflect this. If there is anything you are not happy with please let us know at the time to allow us to rectify this and ensure your expectations are met or managed. We are not perfect but we care about your experience and what you have to say. If there’s something you want, please ask. This makes such a huge difference in helping us to understand your needs and cater to you. Everybody who works at Bliss wants you to have an amazing holiday. Please know we are on your side and want the best for you. We are here to help. What is the difference between Bliss Sanctuary For Women & other Bali retreats? We have many differences to retreats which is why we call ourselves a sanctuary and we are the first in Bali to do so. The main differences are the way we run the sanctuaries exclusively, for individuals rather than as part of a big group. As such we keep our numbers small usually around 5 – 7 people whereas some Bali retreats have 10, 15 and some active retreats up to 30 people! Each individual can choose whatever you would like to do with us and you’re not locked into anything. We have many different packages and you are allowed to change your mind and swap anything as you go. All of our guests arrive and depart at different times and you can have an extended stay. We don’t do shared rooms with strangers and you have all the free time to do what you like when you like. We don’t have a whiteboard with a list of what we are doing that day, your time is your own as is your privacy. We have drivers that take you anywhere you want to go. The essence of Bliss is about empowering women to take time out for ourselves, whilst other retreats are generally about the group and doing many activities together as a group. Our guests can choose your own time or to do things together but it is not expected. Your choices are valuable and your freedom to change your mind is important in designing the best experience for you in the moment. For example, as opposed to being a surf retreat we have a surf package which is tailored just for you and still gives you time for your unlimited massages and anything else you would like to do. It’s the same with yoga retreats, all of our packages have unlimited yoga so you can do up to 5 classes a day if you like! With us you are unrestricted and you have the choice to change your mind each day to go with your own blissful flow. And of course, our inclusions are huge in comparison to typical retreats. Unlimited Massages, Unlimited yoga, Unlimited food and personal drivers to take you wherever you would like to go. This is an important addition that gives you freedom and flexibility and to our knowledge isn’t something included for individuals on most retreats. This is probably the question we get asked the most, especially when some of you are searching multiple places. I would say that each place has their own great attributes and it is best to choose whichever resonates with you the most. How old are the women who usually come to Bliss? Our guests are generally between low 20’s to mid 50’s and all different shapes, sizes, backgrounds and countries of origin which we love. So many of our guests love connecting with the other women at the same time, while some prefer to keep to themselves which is absolutely fine. We cater for all. Many of our guests love to do #blissntells and this gives you a great idea of the gorgeous ladies who come to visit. We even started calling our guests experience full of ‘bliss synchronicity’ where guests from different countries and backgrounds come together and so often end up finding things in common. Women of all ages can take part in any of our activities so if you are in your middle years wanting a surf retreat, with us you would choose the surf package where you have your own personal instructor so you won’t be surrounded by a bunch of twenty something’s in a big group and trying to keep up. Or if you are a beginner at yoga at any age you can go at your own pace and do as much or as little as you like as opposed to being on a yoga retreat where you are trying to keep up with the group, or being held back by the group if you are more advanced. We are completely flexible and the choices are yours. If I am traveling alone, will I be lonely? Well this is completely up to you. Some women prefer their own company or a mix of both their own time and mixing with the group and we are perfect for this type of guest. Others want to do everything as a group or have regimented daily schedules worked out in advance in which case a traditional retreat is probably more your style. Our Western trained hostesses are there to connect with and help throughout your stay and our shared dinners are a great way to connect. But with us your experience is your own to create. I personally believe you can still be lonely in a crowd and we need to connect with ourselves to overcome loneliness. Bliss is an amazing place to connect with yourself and others at your own pace. If I want my own space and time out will I get it? Absolutely! Our groups are small and sanctuaries are large and there is plenty of space for you to relax in our gorgeous tropical gardens or your beautiful peaceful rooms. You can choose to join us for a shared dinner or take it whenever you like in your room. All other meal times are at your leisure and can be shared with others or on your own. There is time for you to have as many massages as you would like, or do whatever else you would like either with other guests or on your own. If you really want your own time, just let our hostess know and we will help manage this with other guests and ensure you get the space you need. That is what we are here for. What sort of food do you serve? We serve yummy food made with love! We cater very well for vegetarians, vegans, pescetarians, halal, paleo, gluten free. You can see our all day menu here. Our food is Indonesian fusion and some Western favourites. You can choose ultra-healthy or spoil yourself. We don’t restrict you in any way and have chocolate hidden in the freezer so you can find it if you need or easily keep away if that is your preference. We have coffee and fresh juices. We have salads or club sandwiches. We do poached eggs and traditional western breakfast or traditional Indonesian breakfast of nasi goreng. You can choose any meals at any time. You can choose to eat in your room or by the pool or in the dining area or as a group at night with a banquet meal allowing you to try so many different dishes. We do our food really well at Bliss and so many of our guests talk about it in their Trip Advisor Reviews. We hope you love it as much as so many of our guests do. I have special dietary requirements, do you cater for these? Absolutely. And for those with big allergies we have two kitchens in each sanctuary and we can prepare your meals completely separately so we don’t compromise on the taste of other people’s meals and we keep you safe and healthy. All our food is made with love! We cater very well for vegetarians, vegans, pescetarians, halal, paleo, gluten free. You can see our all day menu . Do unlimited massages really mean we can get as many as we want? It absolutely does with us. Most of our guests choose 90 mins most days depending on their choices of activities and some choose 3 hours or more! We have 7 full time masseuses across both sanctuaries and if for some reason they still can’t service the demand we have handpicked freelancers who can come in too. We absolutely do not scrimp on this offering and our hostesses are here to help facilitate things for you. If you don’t like the time allotted we can change it and get a freelancer in. If you would like longer than 90 minutes of massage then just ask our hostess. What you choose to spend your time on at the sanctuary is completely up to you and we facilitate this for you. Times are generally based around your chosen activities and finalized the night before to allow last minute changes. Please see our treatments menu here. Why do you price in over 8 currencies rather than all in USD? We price so we are affordable for each market despite the fluctuating world currency market. This means we are often cheaper than our competitors but for us it is about ease and affordability and allowing a space for each of our guests to truly follow their bliss. We would prefer to keep opening retreats subject to demand rather than cramming more people in and charging higher prices. That just isn’t what we are all about. Our currency pricing has been tailored to our guests needs and most banking and payment systems don’t support this. But we do it to put our customers’ needs first. We believe so strongly in this that we don’t have a run of the mill online booking system with currency conversions that fluctuate on a daily basis. We have a full-time sales representative to help you with your booking and to support our guests needs specifically and to make it as easy as possible for you. No other retreats provide personal drivers, what does this actually mean? All of our Packages and experiences include personal drivers, so we have drivers on hand to take you wherever you would like to go at no extra charge. For some guests, this is a full day in Ubud, for others it is out shopping, for others it is sightseeing or going to the tailor or buying gifts … whatever you would like. Our drivers stay with our guests so you always feel safe and can come back to the sanctuary whenever suits you in the moment. This is an addition that allows you complete freedom to design your holiday experience exactly the way you would like it and to change your mind in the moment. Our drivers are handpicked and are excellent at their jobs. What does no schedules mean? When you first get to bliss, our hostess sits with you to go through your booking form and needs for your stay and to let you know how things work at bliss so you feel as comfortable as possible. From here based on the things you say you would like to do we can facilitate different activities daily. For those who do like an outline of their activities we can do this too. Our hostesses are in touch prior to your stay and can pre-organize anything you would like to do, though to be honest many guests change their mind once they get here so with us we are completely flexible and you can choose what you would like to do from one day to the next. So basically, whatever you ask us for, we facilitate it and can make recommendations. What is the most popular package? The Bliss Package is definitely the most popular and this also forms the basis of all upgrade packages. Whatever package you choose you can make additions or changes. If you choose the Bliss Package you can add anything when here and pay as you go. Or if you have chosen an upgrade package and change your mind, then you are welcome to swap any of the inclusions. What do you mean about being completely flexible? Aren’t all retreats like this? Most typical retreats are completely scheduled from the time you wake up to mealtimes and specific programming or activities. Bliss Sanctuary for Women is a totally new concept which is all about designing your experience for you and not the group. As such our hostess works with you to organize your stay as close as we can to what you are wanting. We rely on you letting us know what you want and we take time to speak to you about this every night at dinner and throughout your stay to ensure if your energy levels change or you want to do something different to what you had originally planned then we can do this for you. We do need to honour boundaries of other people’s time around this. So, if you are booked to see a healer then we can’t just change this at the last minute. However, if we are given advance notice it is not a problem. All the people we work with are amazing and we value their time and yours. How many guests do you have per retreat? All our villas have 5 bedrooms and we usually have 5 – 6 guests maximum here with us at any one time. As most guests prefer their own rooms this keeps the numbers down even more and gives your own sleep sanctuary and complete privacy. As our guests arrive and depart on different days and times there is a constant non-disruptive flow which ensures you are treated as individuals not a big group and it’s great to conect with the other guests at your leisure and often they are a great source of recommendations for activities and experiences we offer. Why are you women only? It’s usually the men who ask this lol. It’s simple. It takes the pressure off. Men and women generally want different things. We bond differently. We communicate differently. And bliss is born around creating an environment of deep rest to soothe the soul where many men like to stay busy with activities. And men are often much better at taking time out with their friends than women. So many have their fishing, golfing, camping, sporting trips. They do tend to connect in this way with their friends and actually take the time to get away whereas women often are the ones left looking after the family or chasing the kids around on family holidays. The sisterhood is a wonderful thing and important. It is amazing to connect with other women and many women don’t take time out for themselves, So with us you can relax and let it all hang out lol. You are not on show, there is no pressure and it’s generally a lot quieter this way! Generally, it is best to check in from 9am to 5pm so you have time for a massage and to connect with the other guests over dinner. Flight times are continuously changing however so we have created flexibility in being able to come in late at night and charging a half day rate for this. This does mean you are not welcomed the way we would like and you are shown to your room by your driver and meet the hostess the next day. But many guests have asked for this as opposed to staying at another hotel the night before. Bali is nice and warm all year round, even in the wet season. The peak months are April – mid Jan. The wet season usually kicks in around mid-Jan to the end of March but most rains are sporadic with short 10 minute downpours and most rain being at night. It is cooler in the wet season and still beautiful so for many people this is their favourite time to come to Bali. Why do you have more 5 star TripAdvisor reviews than any other Bali retreat? Due to our exclusivity of small numbers it allows us to connect personally with our guests. It also allows us to fix any issues as they come up when our guests tell us right away. Not being a big group allows each guest to connect to the experience in their own personal way. Although we are not perfect we do try so hard to live up to the expectations of our guests and in most cases, we do this. As such they are happy to take the time out to write the reviews which we are truly thankful for. Especially having a much smaller number of guests coming through our doors than our competitors and most having been around longer than us. And we still have almost double the amount of reviews in some cases. We are so proud and thankful for this. We also don’t mix our reviews, we have a TripAdvisor per location. 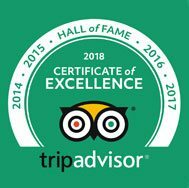 (Canggu and Seminyak) Although this inhibits us getting to #1 in some cases, we feel it is a fairer way of portraying authentically our guest experiences and feedback. As you will see on TripAdvisor there are some lower ranked reviews, though not many. We accept these humbly as usually these guests just haven’t been the right fit for Bliss or their expectations are beyond what we have promised or we simply cannot provide. In most cases these have been a disconnect between that person and our hostess at the time which is rare as all our hostesses are there to help our guests and are loving, caring humans. What we can provide is a kind and humble approach, lots of hard work, a great team of lovely, authentic and smart people with great work ethics and we provide everything we say we will. As such we are blessed with a tribe of giving women who have taken the time out to share their experience for others. We are so thankful. Am I covered in the event of a volcano? Airport closures will only happen if the ash cloud affects the flight path which is determined by a lot of different elements especially the winds which may not go in that direction. If your flight is cancelled your airline will have procedures in place to exchange or refund your ticket. As travel insurance is related to ‘acts of god’ they are generally not covering you after warnings are in place. As such we will act as your insurer of your accommodation so that if you are unable to get travel insurance to cover you at this time we will re-book you at a time that suits you anytime in the next 24 months. This will be subject to your flight being cancelled. Your booking is also transferable. (Please note this only applies where your insurer does not cover acts of god, you must still take out travel insurance as a term of booking). If your flights are cancelled whilst at Bliss and you have insurance but it doesn’t cover you, we will extend your stay FOC or if we do not have room we will organise a basic Hotel at our cost for you. If you choose to upgrade from this that is your cost. For the few guests who have had flights cancelled in the past due to ash clouds, they are often still able to come within the next couple of days so if you have a little flexibility this could still work for you. If not we can change your booking dates to anytime in the next 24 months. In terms of physical safety we are over 70 kilometres from the volcano and should not be affected. The worst case scenario would be some ash could come our way if the winds swing that way in which case we have masks available as an extreme option to ensure all bases are covered. If this happens and your stay is affected we will rebook you FOC for the amount of days affected anytime within the next 24 months. So is Bali safe? Yes it is unless you are within a 7km radius of the volcano which has been evacuated. The volcano could simmer down completely or it could be another year until she blows if at all, so it is simply something that may affect your booking in terms of inconvenience with flight changes, but this may not necessarily be the case. Please consult your doctor if you suffer any breathing difficulties but for the average person this should not be a problem. Due to the volcano Bali is very quiet so we would really love to have you here to help support the local community, jobs, overall travel confidence when you tell your friends and most of all it will be very peaceful for you with a lot of blissful moments. It is an outside chance that the volcano will affect your stay, but it is still a chance so we hope the strategy we have put in place will help give you some peace of mind just in case. Please don’t hesitate to ask if you need any further clarification. We live in Bali, work in Bali and we love Bali. Life is just the same for us and we really hope to see you soon. Email bookings@blissinternational.com for any further information. We are here to help. Do you allow smoking at the sanctuaries? Bliss is generally a non smoking venue and definitely within the bedrooms, however we do have a communal smoking area in our Seminyak Sanctuary and in our Canggu Sanctuary you can upgrade to our Bliss Luxury Suite which has it’s own private outdoor area that you can smoke in or if you are traveling with a friend our double Joglo has it’s own private balcony where you can smoke (if your travel companion agrees). We want you to feel comfortable at Bliss as well as having our non smoking guests also feeling comfortable.